Hey-oh! How's it going, guys? But anyway, it's been a pretty nice Monday night. Actually, no part of this day was bad. Because I spent a good portion of the afternoon taste-testing homemade hot chocolates. I know, I KNOW. But anyway, once I mastered this recipe, and took some pictures of the final product, I sat down and thoroughly enjoyed it. Every single sip. Without looking at my phone, without thinking too much about anything. It sounds super-duper cheesy, but it was just me and my hot chocolate hanging out on a really beautiful day. And then... all the feels hit me. I started thinking that maybe all Mondays should have a mandatory "hot chocolate moment". Because really, life is too short to not enjoy every. single. day. We've got to remember what's important in this life, ya'll! And I promise it's not about impressing your boss, or skipping out on dinner with great friends because you've got to be up early the next day, and it's definitely not about being afraid to go for the things you really want. Whatever they may be. Step out of your comfort zone today - even if that only means enjoying a little old cup of hot chocolate for five minutes on a weekday afternoon (while standing over a sink full of dirty dishes). Okay, now that I've got that out of my system, let's get back to this Homemade Creamy Hot Chocolate! It only requires 4 simple ingredients and you probably already have them all in your kitchen! FOUR ingredients. FIFTEEN minutes. PURE happiness in a mug. Get in on this hot chocolate guys! It's super easy. You don't have to guess what kind of ingredients you are consuming, like you would if you were to buy some instant hot chocolate from the store. And this guy is clean! That's right GUILT FREE hot chocolate. BOOM! I like to stir my hot chocolate with a cinnamon stick, and I really like to top it with things like: pumpkin spice, maple syrup, marshmallows, and coconut flakes (to name a few, hehe). 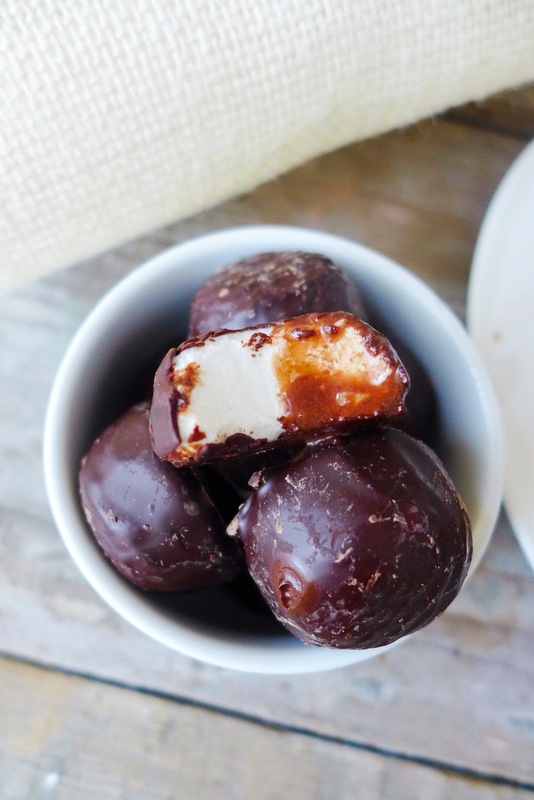 I really, really love to snack on chocolate covered marshmallows while drinking hot chocolate, or coffee... well, I like to eat them always actually. But definitely with hot chocolate! Haha. I found these at my local health market, but you could easily make them by dipping marshmallows into melted dark chocolate. Just let them sit in the freezer for a few minutes before serving/eating. What are some of your favorite hot chocolate toppings? Let me know in the comments below! 1. Add almond milk to a small sauce pan. Cook over high heat until the milk reaches a small boil. Stir in cocoa powder, maple syrup, and coconut sugar. Stir until well combined. Reduce heat to a simmer. Continue to simmer for 10-15 minutes and you get a thick, creamy consistency. Serve hot with a cinnamon stick and marshmallows.